Neon tubes or LEDs illuminate most of the work in Carroll Square Gallery’s “This Is Light,” a show of four East Coast artists, but the most intriguing piece features an old-fashioned slide projector. In Tommy Bobo’s video, “Umbra,” a circle of blurry light is periodically obscured by or merges with a glowing orb, accompanied by crackling sounds. The device that produces the change gradually becomes discernible and is not exactly high-tech: It’s a gum-chewer who blows and then pops bubbles in front of the light ring. Pamela Gwaltney contributes a tower whose LEDs cycle through the color wheel. Esther Ruiz contrasts neon semicircles with their wood or concrete supports in such sculptures as “Bifrost II,” named for Norse myth’s rainbow bridge. 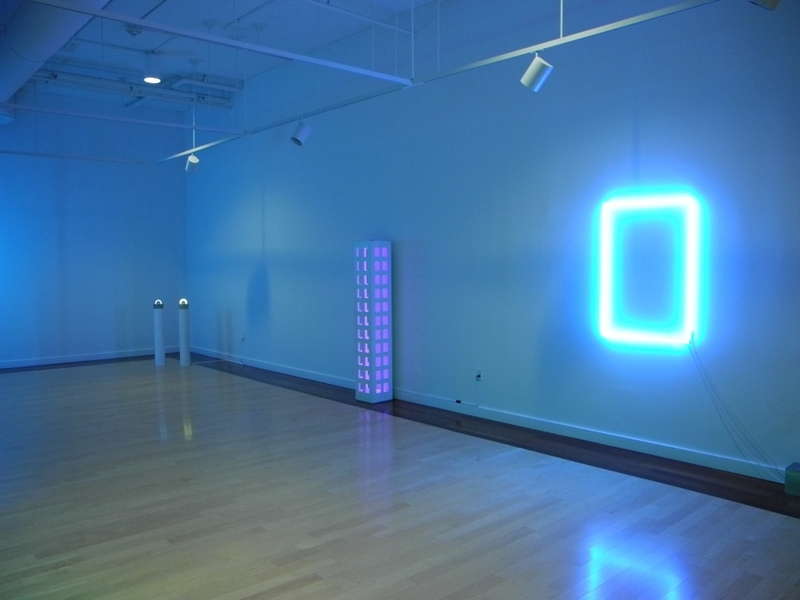 More eerily effective is Lisa Dillin’s “Window F,” a pale blue rectangle. The “F” in the piece’s title may not be short for F Street, the location of the gallery, but this stark suggestion of a window in darkness does conjure an entire night town of beckoning portals.